The pungent aroma of cinnamon is unmistakable, usually evoking dreams of hot cinnamon rolls from the oven. Cinnamon was once so highly-prized that wars were fought over it, it was used as currency, and it has aphrodisiacal powers. Native to Ceylon (Sri Lanka), true cinnamon, Cinnamomum zeylanicum, dates back in Chinese writings to 2800 B.C., and is still known as kwai in the Chinese language today. Its botanical name derives from the Hebraic and Arabic term amomon, meaning fragrant spice plant. Ancient Egyptians used cinnamon in their embalming process. From their word for cannon, Italians called it canella, meaning "little tube," which aptly describes cinnamon sticks. 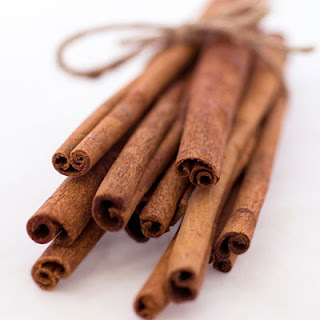 Medieval physicians used cinnamon in medicines to treat coughing, hoarseness and sore throats. As a sign of remorse, Roman Emperor Nero ordered a year's supply of cinnamon be burnt after he murdered his wife. The spice was also valued for its preservative qualities for meat due to the phenols which inhibit the the bacteria responsible for spoilage, with the added bonus being the strong cinnamon aroma masked the stench of aged meats. In the 17th century, the Dutch seized the world's largest cinnamon supplier, the island of Ceylon, from the Portuguese, demanding outrageous quotas from the poor laboring Chalia caste. When the Dutch learned of a source of cinnamon along the coast of India, they bribed and threatened the local king to destroy it all, thus preserving their monopoly on the prized spice. However, by 1833, the downfall of the cinnamon monopoly had begun when other countries found it could be easily grown in such areas as Java, Sumatra, Borneo, Mauritius, Réunion and Guyana. Cinnamon is now also grown in South America, the West Indies, and other tropical climates.